Another week down, and it’s not getting any better. In fact it’s gradually getting worse. Another week down, and it’s not getting any better. In fact it’s gradually getting worse. I thought Monday mornings sucked already, trying to get out of bed when it’s 5 degrees and you’ve just failed to crack 2000 is about as tough as it gets for a Fantasy Coach. Says a lot really. We can consider last weekend a warm-up, because if you thought these scores were bad I can’t wait for this time next week. Yep, it’s that time of year when we have less football to enjoy, less players on our ground and heaps of these weird blue dots on our field. Let’s wash-up the weekend! 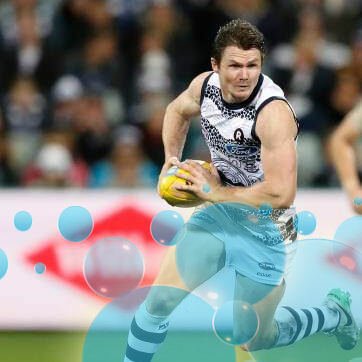 Dangerfield (125) – If you made the wise call of not starting with Danger, I’d be getting him in this week before it becomes a more costly decision. Dangerfield was an obvious loophole choice for Thursday night, congratulations to those who were smart and didn’t get greedy. I obviously wasn’t in that boat but I’ll back in my boy Titch all day. I look forward to his loophole revenge this Thursday night. S.Selwood (119) – Not many players in the history of the game (Probably never) have had more tackles than disposals in consecutive weeks. Scooter is hugging like there’s no tomorrow, and it’s bloody lucky he is because otherwise his scores would be ugly. I’m happy to pass as there’s simply no way he will average 18 tackles per week, or even close to that number. Still, well done to those that got him in early. J.Selwood (122) – One thing you can’t argue is that Joel Selwood loves playing down in Geelong. His record at Simonds Stadium speaks for itself, and Geelong have another 2 home games in the next couple of weeks. Perfect time to get on board if you’re confident Joel can buck his trend of averaging 104-106 every damn season. Z.Jones (119) – What can’t Horse Longmire do? Zak Jones is a machine when put in the guts, so it goes without saying that he rarely gets to play there. Having been on 2 at quarter time, Zak attack went on a rampage. With a BE of 74 you surely have more pressing issues to deal with, but he’s a scary player to own. You’re relying on John at the end of the day. I.Smith (133) – Isaac Smith’s form has slid under the radar and this was a massive score from a forward. His average is nothing spectacular, but he’s now averaging just 0.6 less than popular pick Dahlhaus. With 3 tons in his last 4 games, he has to be in the mix for a top 6 forward spot. Great pick. Newnes (143) – Remember this guy?! We were just a couple of seasons early, god we can spot Fantasy potential from a mile away. After being concussed for just 10 points in Round 9, Jack Newnes bounced back in a big way this week. That injury affected score aside he’s averaging 100 for the season and is nicely priced at $504k coming off his bye in Round 12. I’ve seen crazier picks. Montagna (123) – Monty is going about his business quietly, this ton takes his season average to three figures! He’s reliable, consistent and has a big ceiling. Basically everything our forward premiums aren’t. It’s +6 city down in the Saints defence, you can’t go wrong. N.Jones (123) – I don’t give Nathan Jones much love, so here it is. Much love Nathan. Hall (117) – Boom! I thought I was onto a game changer at quarter time when Hall looked on target for another 150, but I won’t complain with this score considering some of our other premiums efforts. He’s more than capable of averaging 110-115 and should still be on your radar this week. He has a near perfect Fantasy game! D.Martin (133) – Dusty is so inconsistent that I find it hard to know where he places at the end of the season. He should be a top 5 mid, but then has a game off every month to get on the gear. That’s a pre-requisite for some teams but I need my players fully focused. Perhaps a sniff at a Brownlow will improve his consistency? If you’re after a Round 12 midfielder then I’d look no further. Gun. Zaharakis (131) – Not going to say I told you so, but… Whoops I just said it. I wouldn’t even dream about getting him now, if I did it would be a nightmare. His 3 round average does place him as the fourth most in-form player in the comp, so well done to anyone stupid enough to get him 2 weeks ago! Heppell (123) – Heppell owners who scrambled aboard after his Round 1 score have had a long wait for this triumph, so there you go. Enjoy it. Mostly because it won’t happen often. Sloane (157) – What are we going to do with you Rory… He had been a disastrous pickup for many, yet his 3 round and 5 round average is 110. His ability to produce absolute tripe is amazingly matched by his ability to score 150+. Have Freo not seen the success opposition teams have when tagging Sloane? Did they want to lose by 100? Was their recent form hurting their future draft plans? Either way this score was a massive relief to Sloane owners. He’s back! Otten (107) – Congrats Andy on becoming only the third rookie to make the legends this season! He has returned to the forward line which is where he needs to be. Sure when Adelaide are beating a team like Freo by 100 points just about anyone could snag a few, but they dominate lower opposition. Did I hear flat-track bullies?… Not going there. I get the feeling he might have a tougher time of it down at Simonds this weekend. Nevertheless he has bought himself time until his bye, massive win. Blakely (119) – I really should have the courage to back myself on these left field picks, Connor Blakely is here to stay! There will be ups and downs no doubt, but he’s a Fantasy gem. His 5 round average is now 110! Future uber premium. Pendlebury (125) – The new age Pendles is exciting and I love it! This is his third 120+ score in the past 5 weeks, he’s nearing career best form which is saying something. 9% ownership is a bit laughable and a bad look for us serious Fantasy coaches. We all know how good he is, why don’t we ever buy him? Is being a smart, risk free pick boring? Probably. Zorko (124) – Dayne Zorko is averaging 118. WOW. When you put it like that, his 4% ownership is even more of a joke than Pendles. Zork is hitting 110+ 70% of the time, you can’t go wrong owning him. Legend! Gibbs (145) – I said last week that it was good to see Gibbs back in form. Now I’m starting to think he has flown past Murphy once again! His three round average of 127 is massive. Damn this Round 11 bye. Great pick. Docherty (130) – It’s becoming crystal clear that Docherty was the must have premium, perhaps alongside Taylor Adams and Tom Mitchell. It doesn’t hurt any less each passing week, and watching his price constantly tick upwards only increases that pain. At this rate I’ll never afford him, and it’s going to cost my season. What a beast. An absolute seagull of course, but that’s what we’re after! Gaff (124) – It was a nice sunny afternoon at Subi so Gaff had no problems racking up his 35 disposals. He even laid 3 tackles! That must nearly be a PB. Yeo (118) – Incredibly, people still don’t want to believe Yeo is a top 6 forward. Not only is he a top 6 forward, he’s quite clearly the best forward option you can have. The next 2 best averages? Koby Stevens and Cameron Pedersen. So, yeah… Elliot Yeo doesn’t sound too bad after all. Parsons (27) – Aaron Black lost his place for this? Give me a spell. Lloyd (2) – This sucked. I’m about as selfish and unforgiving as Fantasy managers come, but even I couldn’t laugh at this score. I’ve wanted him all season and there’s not much that can be said to console his owners. Enough of that non-sense, I look forward to picking him up for $500k in Round 13. You beauty! Parker (66) – What have I missed here? I thought Luke Parker was meant to be a gun footballer? He’s crap. This score is garbage. That effort was trash. He is no longer capable of taking a mark, he doesn’t tackle and he doesn’t win much of the footy. Having watched him in agony the past few weeks, I can safely call him overrated. This spray is just about my last hope. Dahlhaus (75) – It’s lucky the majority of coaches own Dahlhaus because he can make watching the Bulldogs extremely painful. They all can, Macrae isn’t faring much better either. Forget team footy first, go and look after number 1! Miller (54) – Fair warning, this is the last time Touk Miller is being mentioned in this article. Dead to me. 60 foot under. Hanley (30) – Did you know Pearce Hanley is still running around? Weird. You can’t be blamed for not noticing when this is what he produces. I was genuinely surprised when I spotted his name today, it’s probably the last time I’ll bother stopping to read his score. Fyfe (80) – …………………………… This is a Nyfe to the back. Let’s take a moment to remember that Robbo placed Fyfe at number one. ONE. Best player in the AFL my ***. I really thought he was going to go bonkers this season, instead his head is clearly elsewhere. Is it at the Saints? Is one Brownlow enough for his career? I don’t know what kind of contract the Saints were offering but I don’t think 24 disposals, 4 tackles and 4 marks per game cuts it. That’s what Fyfe has produced since Round 3, failing to crack the ton and averaging 81. Pathetic. B.Hill (50) – The Freo gems keep serving up prime scores, this time it was Brad Hill sticking it up his owners. This is what happens when they’re not skiing downhill against bottom half opposition. In fairness it was wet and they were belted, Hill has earned a second chance this week. Neale (60) – Another Fremantle player producing utter tripe. This week was so bad perhaps we can consider it an outlier, then again my boy Blakely wasn’t fazed so what’s Neale’s excuse?! Some massive scores are owed this week! Waite (53) – Just a weekly reminder that somebody somewhere traded in Jarrad Waite for $550k. It can always be worse. Shuey (-) – I want to give West Coast the benefit of the doubt that Shuey’s injury was picked up after team selection, but I get a feeling he would have been struggling all week. It’s the 21st century and clubs seriously believe it’s beneficial not to be honest with regards to player health and team selection? The mind games certainly didn’t help them, losing the clearances by 23. All I can say is it was better to happen this week than next! Unless of course you traded in Shuey this week, which 77 people actually did. If anyone has gone missing in the past 48 hours, just try checking your shed. Enter with precaution, who knows what you’ll find. It’s nominations time and there wasn’t a lot to choose from. I spot two clear contenders! Sloane – I wasn’t going to nominate Rory after his recent efforts, but 157 is so big that it nearly makes up for it all. Piggish. Docherty – I’d be lying if I said I kept a record of Stubby winners, but I’m not sure Doch has won one yet. Surely he has to be recognised this week! Kreuzer – I’m guessing his Fantasy owners are all Carlton fans, but I managed to grab him in Round 12 of my draft as a precious ruck. That’s enough to get my vote! Gibbs – Carlton fans are getting all the love this week. They need something I guess… Gibbs had 38 touches and absolutely dominated. Otten – You beautiful man! I was in no position to trade a topped out rookie last week, and thank god I wasn’t. It’s nice to be on the right end of a kiss for once… That sounded better in my head. Get voting! It’s common sense to suggest that with each 2 trades we make per week, our teams will gradually get stronger. Sure a few sideways trades will be required to fix up an injury or dud rookie, but most should be downgrades and upgrades. So how have your 18 trades gone so far? Personally, I fielded just one less rookie this weekend than Round 1. Each week I get caught up in improving my scoring potential short term, take un-necessary risks and only hurt my squad. Now guess what, my team is actually in decline! 1995. Great year 1995, gave birth to a troubled Fantasy addict. Not famous for much else. As a bald Pawn shop owner once said, I’m Matthew Craig, and THIS is my Fantasy team. I work here with my best friend, procrastination. Every player has a story, and a price. One thing I’ve learned after 9 years, you never know WHO I’m gonna pick next. So what’s on the menu this week?! 3 rookies in and still probably a donut to eat. Cousins, Cunico and Scharenberg all look solid, while Luke Ryan could possibly come in. There’s no guarantee that we’ll get any more downgrade targets for the rest of the byes, so stocking up this week could be smart. Lastly, can we all pray for Daniel Butler this week. From nearly every Fantasy coach around the country Dan, get up. Seriously. Play on one leg. Hold Dimma hostage, whatever it takes. Good luck for Round 11, it’s going to be ugly. Put it this way, it shouldn’t get any worse after this! Trading Fyfe to Ebert or Hall, Marchbank to Schrenberg and Roughy to Barlow. SPP to Ebert, Hall or Martin, Marchbank to Schrenberg and Eddy to Cunico so that gives me $$ generation. Or I trade Fisher and hold Pep. But Fisher doesn’t give me a good mid to trade to as he’s not made enough $$. Currently done the 2nd option. Dusty is looking really tempting and has a good bye to. Entertaining and making me feel better about my team! Good Intel on players too, a bit harsh on Pierce Hanley in probably his toughest year, here’s hoping he bounces back! ?? Strange comments, he’s played 2 games this year and his little brother just died of cancer. I wouldn’t think your comments are warranted, pretending to be Jasper Pittard. Sorry, was just focusing on his tendency to have one really amazing game in previous years, and then follow it up by completely going missing. Last year, as one of Brisbane’s “leaders” he looked so disinterested at times, didn’t chase properly etc. Cool, yeah not really fantasy relevant anymore, I think we all had our eye on him given its a new club and new start, but his year has been railroaded. Absolute brutal week for me too, just scraped passed 2000 putting me just on the edge of top 1000… Took a risk on Scooter which payed off, but Walters in the wet killed me..
Who do you think is the best FWD for the rest of the season – Barlow, Wingard, Ryder? Yeo if you haven’t already got him. Otherwise wait for DPP additions in round 12… forwards are the hardest to pick this year! Another great read, well done. 2045 for me with Lloyds 2 and a smattering of wins and losses in my H2Hs. So not terrible, not great. OR is rubbish (a bad start is so hard to correct) at 5168. Slowly working on that though. I currently don’t have any Port or GCS players, and to be honest they don’t really float my boat. So I think I will play the long game, grab a couple more Rnd 12 bye guys this week, still be able to field full 18’s each week and have a side after Rnd 13 that I would prefer rather than have it full of guys I didn’t really want in the first place. So, current trades are : Black, Fisher, Preuss out. Yeo, Cunico, King (cash grab only) out. This means I have 18 players this week. Currently would have 19 for Rnd 12 and 15 for Rnd 13. With 6 trades to do before Rnd 13 starts I will have at least 20 for Rnd 12 and probably the same for Rnd 12. Happy enough with that. A great fun read, Matt. Your plans for this week are similar to mine. Scharenberg, Cousins and Ryan in. But it’s a risk. Ryan, if in, does play until Sunday, so his place will not be certain until Friday, a day after Cousins plays, thus preventing a trade reverse. Oh well. Speaking of risks, I’m planning next week to bring in the AFL’s No 3 forward (and ruck DPP) Pederson. There! I said it publicly and now the guys from the funny farm will be out to pick me up. Without seeing any of their games… any opinions on this crop of rookies? I know Ryan is unseen, but how did the likes of Cousins, Cunico and Scharenberg go? Vs the prospect of trying to make some cash from a risky prospect like scooter? Looking forward to Jeppa’s take, but was wondering what other crew were thinking? Cousins played his role well, would be surprised if he is dropped. Didn’t see Scharenberg, but surely the pies are planning on keeping him in the senior side. Not impressed with Cunico’s first game. Cousins appears to be good for a few games and I was at Scharenberg’s game and he was solid. I think he his the pick of the 3 and, fitness permitting, will have very good JS. I hope to get in 2 of them – not Cunico. Thanks for that lads… looking at cousins and Ryan, but maybe I’ll upgrade him to scharenberg. What about Steelbottom? My gun for the round on debut. Sitting low on draft league due to drafting Fyfe and Hanners early and their form not as expected. Took a risk and traded for Parker as well, thoughts were if Fyfe and Parker return to form itd be pretty special. Is there any hope? As someone who’s owned Parker all season, I would say there’s no hope. He’s way down in all statistics and doesn’t look like a 105+ player any more. Oh well there’s always next round to look forward to…hang on the byes are here, I need a beer…. Great work again Matty. Thought of you when I saw Walters score – moron haha. I just couldn’t do it again this year – the pain of it. At least he got a ton for you last week as you said. My bye plans are falling down like knickers on a prom night. Before trades have 9 R11 players, plus Pruess, McInnes, Luke Ryan, Black and Parsons who might as well be not playing. So that leaves 17 plus whatever 3 I can bring in unless a miracle or more happens with any of the above 5 are named. L.Ryan will be in. I’m hoping on Preuss, and Parsons has been playing for a while now so fingers crossed! Has there been much talk on DPP changes in R12? Anyone got any ideas on who’s looking for change? Where would they move? Defense? I’m wondering for draft comp so any player is relevant. Do I win this trade in my draft league? I recieve issac smith and degoey but I get rid of billings and walters. that is a great trade but rumour has it that he is injured. Well what can I say 1 very good trade last week Balic > S Selwood and one god dam stupid useless trade JKH > WALTERS instead of Greenwood. Thoughts on bringing in Polec for the byes? What has been behind his recent good form?